Fighting for the right for all Americans to have their day in court, Better Markets joined lots of other advocacy groups in a letter to SEC Chairman Jay Clayton, urging him to reject a pending attempt to take away shareholders’ rights to recovery when ripped off and to force them into secret, biased arbitration proceedings where they almost always lose. A Johnson & Johnson “shareholder” (who just happens to have headed an “independent” committee established by the Chamber of Commerce) is pushing for such a resolution to be considered at the company’s upcoming shareholder meeting this Spring. In the past, the SEC has repeatedly rejected such maneuvers because if adopted, they would in effect force shareholders to lose the protections of the federal securities laws. This time around, it’s not so clear how the SEC will react. What is clear, however, is that forcing arbitration on shareholders, consumers, or investors is a terrible idea. 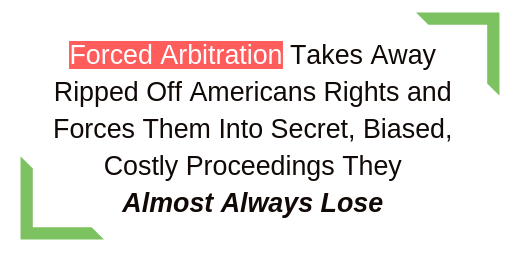 Arbitration is biased, expensive, unfair and secretive. Ask yourself, if it was so great, why would it have to be forced on shareholders? It also amounts to de facto immunity for corporate fraud, and it will undermine confidence in the integrity of the securities markets, on which many Americans rely to save for a college education, a better standard of living, or a secure retirement. It’s unfair, because the deck is stacked against investors and consumers in arbitration. There is no judge or jury, only a panel typically comprised of people who worked for years in the industry. The facts show that victims of fraud and abuse who seek justice in arbitration against large banks, brokers, and other firms, almost always receive little or no relief. And there is virtually no right to appeal even a shockingly bad decision. It’s not transparent, because unlike cases tried in court, arbitrations are conducted in secret, and panels aren’t even required to provide an explanation of how they arrived at their decision under the facts or the law. Because ripped off shareholders have to go alone against the well-funded corporation and hire their own lawyers out of their own pockets, almost no one files for arbitration because the losses usually don’t justify it; the costs are high; and the outcome is at best uncertain and, more likely, almost certainly adverse to the individual. Companies thus avoid liability and keep the ill-gotten money they took from their customers and clients, usually representing huge sums of money in the aggregate. Ultimately, when investors realize they have no meaningful remedy if they are ripped off, they result will be that they won’t be so ready to invest their money to the stock market. The Joint Letter also makes the case for the SEC to at least address the issue at the Commission level through an open and deliberative process. This is, at a minimum, what Chairman Clayton has promised to deliver in the past when it comes to possible forced arbitration in initial public offerings. If the SEC changes its longstanding policy and permits the forced arbitration resolution to go forward with just a secretive staff-level approval, it will betray its core commitments both to investor protection and to transparency in government.